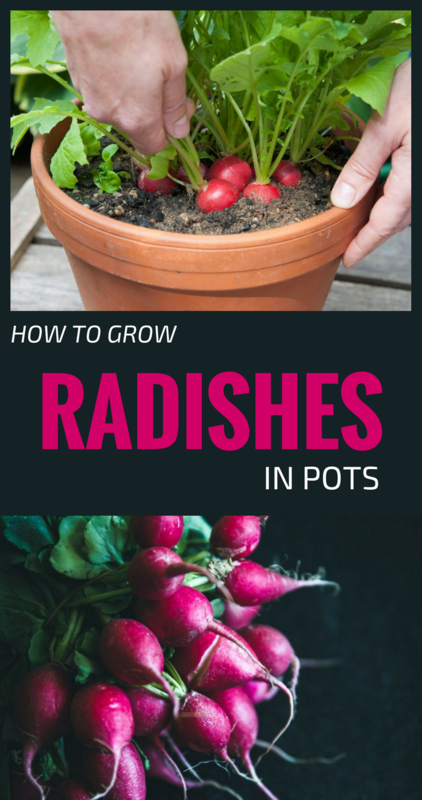 Radishes grown on the balcony is sown directly in pots at the end of winter, at a depth of 2.5 centimeters. Of course, after sowing the soil in the pots, tap it easily. Irrigation is best to be done before sowing, because if you do it after sowing it might bring the seeds to the surface or bury them too deep. The radish germinates at a temperature higher than 37 degrees Fahrenheit. It has a short period of germination, rising in 3 or 4 days. To speed up plant growth, pots can be covered with a polyethylene film. If you sowed radishes too close, and to avoid harvesting thin radishes, you should thin their leaves when they have 2-3 leaves. In a pot of 25 centimeters deep and a surface of 25 centimeters square, can be grown 9 or 10 radishes. The distance between two plants should be about 5 centimeters. Radish grown on the balcony prefers sunny positions with a few hours of shade a day. The intense sun stimulates the growth of inflorescences (the optimal temperature is about 57 degrees Fahrenheit), in this case the radish will produce only flowers. How to plant radishes on the balcony? Growing radishes on the balcony is not difficult, preferring a medium-rich organic soil, medium texture, kept moist but without water stagnation. Radish irrigation on the balcony must be regular and moderate; the soil in the pot doesn’t have to dry. Lack of water will have the effect of ridding the radishes. Harvesting the radishes grown on the balcony takes about 4-6 weeks. There are many radish varieties, but I would suggest choosing the ones with red and round root variety. Growing radishes on the balcony is recommended for beginners, for those who want to learn to plant potted vegetables on the balcony. Radish can be associated with salad, because it has about the same period of growing, so they will leave the pots in the beginning of May when tomatoes, peppers or other vegetables can easily be grown on the balcony. So, as you can see growing radishes on the balcony is very easy, and this veggie is the best you can start with. The results will be encouraging.